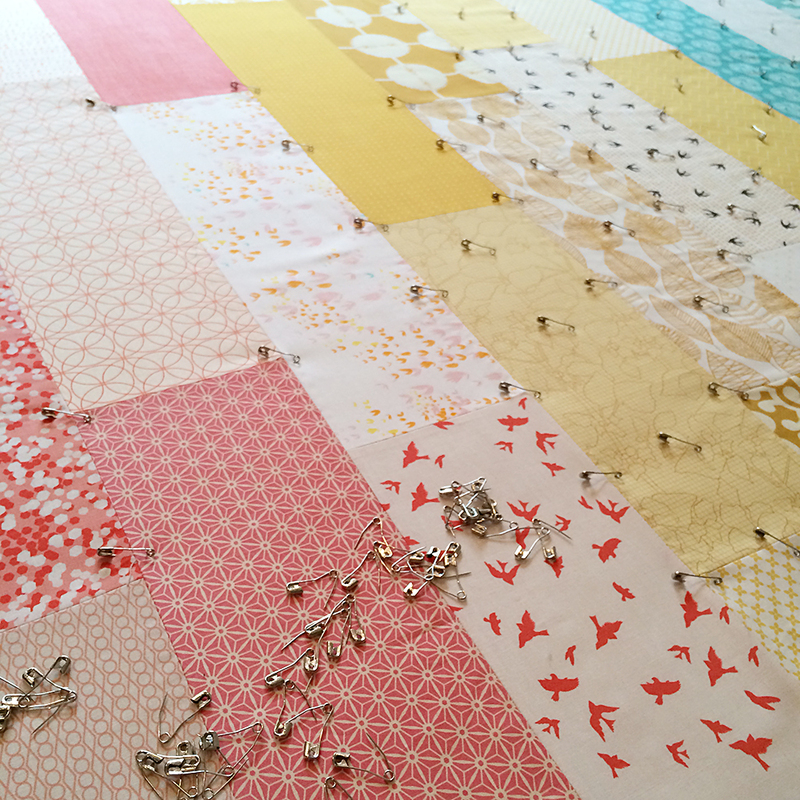 A quick post today to show that I have not been lazing around, but am truly working on finishing up my next quilt. I always procrastinate when it's time to baste because I really just do not enjoy it. With small items like pillows, I spray baste. But when it comes to quilts, I just don't get the same finish quality as when I pin baste. But I do know others that have great success with spray basting, so I always say you should do what works best for you. I had always planned on doing straight line quilting on this one. When I received the Bernina 750, I knew it didn't come with a walking foot. I asked during my training if I could use the walking foot from my 440 with it and found out yes, I could. But I might not want to because the 750 has a dual feed system that can be used for straight line quilting. Then, at quilt guild last week, my friend Catherine assured me that the dual feed on the 750 works great for quilting. Yep, I was still skeptical because I am really stubborn like that. So I thought I would do a little test. I set up my machine with the dual feed. 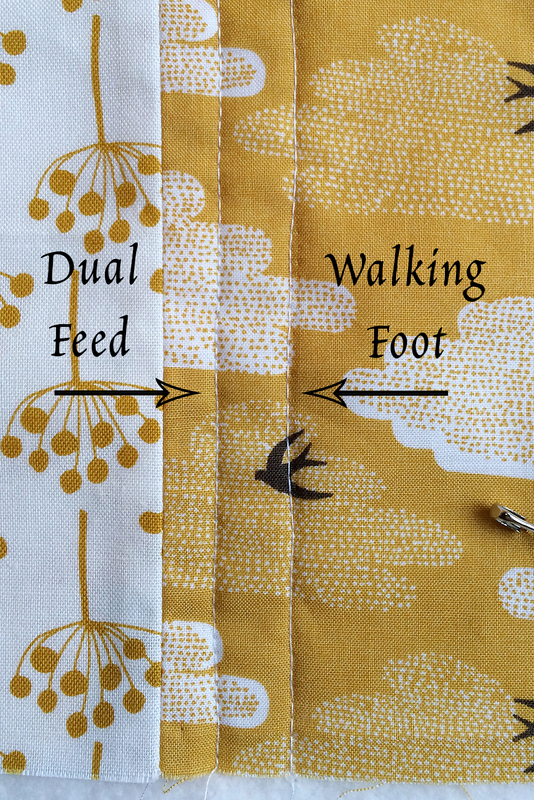 I followed the recommended pressure foot settings for quilting from my manual. You can see on the screen above, I changed the pressure from 50 (the default) to -10, as recommended. I switched my needle to a 90/14 Machine Quilting needle and got to work. I stitched a line with the dual feed setup. Then I switched to my walking foot. Below, the dual feed line is on the left and the walking foot line is on the right. Ok, here it goes. I.Was.Wrong. Yep, the dual feed did an amazing job! And not so much the walking foot. I will say once I saw how good the dual feed was doing, I didn't spend a ton of time tweaking my settings to try to make the walking foot look as good (messing with pressure foot settings and such). *** Update *** This morning I spent some time testing settings again with the walking foot. With the right settings, the walking foot worked great, just as nicely as the dual feed. Below is a photo and the settings I used. So there you go! Now I have the option of using both the walking foot AND the dual feed - I just need to check and double check my settings before getting started. So I'm going to spend much of today continuing with my straight lines. Over and over again. It always takes longer than I remembered, but it's turning out great!